The only non-abrasive way to remove stubborn environmental contaminants, tar, and bugs! The Wolfgang Elastic Poly Clay Kit is like detox for your paint! Wolfgang’s Elastic Poly Detailing Clay removes contamination better than washing alone, to leave your vehicle slick, shiny, and totally clean. Use the Wolfgang Elastic Poly Clay Kit after washing but before polishing or waxing to set the stage for the ultimate finish. The Wolfgang Elastic Poly Clay Kit contains Wolfgang Elastic Poly Clay and Wolfgang Clay Lubricant. This pair of products does more to deep clean your paint than washing or polishing! 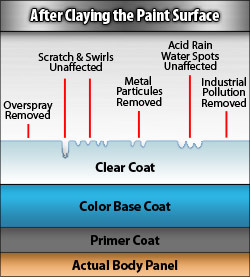 That’s because clay works to remove contaminants that are trapped within the outer layer of paint. By removing microscopic contaminants from the paint, it feels unbelievably slick and gains a mirror-like gloss. By using the Wolfgang Elastic Poly Clay Kit twice a year, you’re ensuring that your vehicle is truly clean and free of paint-damaging grime. The major sources of paint contamination are rail dust, brake dust, industrial fallout, tree sap, and airborne pollution. 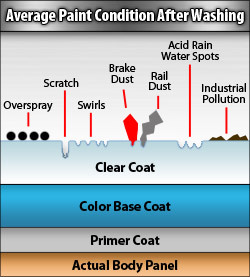 While you can’t always see these contaminants, they surround your vehicle and bore their way into the paint, creating weak spots. Over time, the paint feels rough and gritty. Ultimately, these spots accelerate oxidation and can one day lead to paint system failure. The easiest way to clean and protect the paint is by using the Wolfgang Elastic Poly Clay Kit twice a year and keeping the paint protected with either a wax or paint sealant. Tech Notes: Car must be clean and dry before using clay. To properly preserve your Wolfgang Poly Clay, spray it with Wolfgang Clay Lubricant and store it in a sealed plastic bag. Store clay at a moderate temperature. It will last through seven to ten applications if cared for this way. It’s time for a new clay bar when it is full of debris or doesn’t seem to grab particles any longer. Be sure to keep the surface area being worked on well lubed. Check clay often for any particles that might scratch the surface, and shave them off. When you’ve clayed the entire car, buff it clean with a dry towel to remove any clay residue. Rinse and dry your car. For the ultimate outcome, follow claying with Wolfgang Pre-Wax Polish, then protect and seal in the shine with Wolfgang Deep Gloss Paint Sealant or Wolfgang Füzion Estate Wax. This will yield an unbelievable showroom-quality finish. Use the Wolfgang Elastic Poly Clay Kit to deep clean your vehicle twice a year to make way for the ultimate concours gloss! Use these microfiber detailing cloths for drying, buffing, or as a finishing touch. Microfiber is designed to be light, strong, super-absorbent and quick drying. The fibers are non-abrasive, and are woven so tightly that it’s absolutely lint free and extremely durable. Unbelievably, these ultra-tough fibers are engineered to absorb seven times their weight in moisture. When using on windows, it produces a streak-free finish. 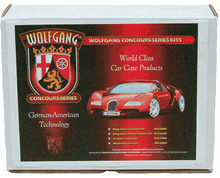 This DVD demonstrated step by step each Wolfgang product. You'll see the detailing process in real time and the actual results. Learn how to get the most out of this kit! A $63.94 Value. Save $28.95!